Why Is Palm Beach County Struggling To Meet Recount Deadline? The Palm Beach County canvassing board members: Irwin Jacobowitz (left), judge August Bonavita (center) and Supervisor of Elections Susana Bucher. A 3 p.m. Thursday deadline looms over Palm Beach County, which has experienced issues to finish its recount. Supervisor of Elections Susan Bucher said Wednesday she's entered "prayer mode" to make it on time. Susan Bucher, Palm Beach County’s supervisor of elections, said Thursday morning “the likelihood is pretty slim” that she will meet the 3 p.m. recount deadline for even just the U.S. Senate race. Voting machines overheated Tuesday, and the county was forced to restart the process after about 175,000 early votes had already been processed. A case to extend Palm Beach's deadline went to federal court and was pending as of Wednesday afternoon. U.S. District Judge Mark Walker ruled Thursday to give Florida voters until 5 p.m. Saturday to fix ballots that were rejected because of mismatched signatures. Miami-Dade Counties finished its recount on time, and Broward County was nearly done as of Thursday morning. WLRN’s Alexander Gonzalez spoke with Palm Beach Post reporter George Bennett about what went wrong in Palm Beach County. WLRN: What's going on in Palm Beach County with these voting machines? GEORGE BENNETT: Apparently, unlike any other county in the state, Palm Beach has aging tabulating equipment that does not allow it to conduct more than one recount at a time. So the election supervisor Susan Bucher with three statewide recounts to conduct – plus a local recount – said that she would not be able to finish all of them in time for Thursday's 3 p.m. deadline. 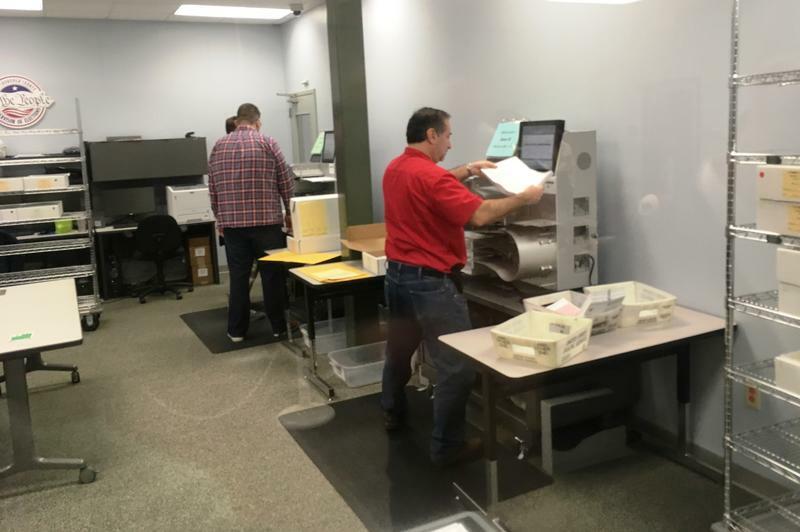 On top of that, on Tuesday night, the tabulating machines basically conked out during the night and delayed the machine recount several hours. They were up and running again Wednesday but it was just another problem for what was already shaping up to be a recount that was not going to meet the deadline. What's been Susan Bucher's response? The bottom line is she was hoping to get one more election out of this aging equipment and then have new equipment in 2020. But alas what was supposed to be the final major election for these machines, they were called upon to do more than they are capable of. This is not the first time Palm Beach County has dealt with voting machine problems. We can, of course, remember 2000 with the butterfly ballots. How does that watershed moment compare to what's happening now? Palm Beach County gained national and international attention in 2000 during the presidential recount. One for the so-called butterfly ballot design that apparently confused a large number of voters in the presidential race. Then, on top of that, this was one of the large counties where recounts were conducted using punch card ballots. So you had the spectacle of canvassing board members here looking at partially punched ballots and looking at what were called chads that were dimpled or hanging and trying to divine voter intent from them. After that spectacle, the state of Florida banned punch card ballots and tried to establish more clear guidelines for manual recounts in the future. So 18 years later the technology has changed. Florida uses optical scan ballots, and there are more clear guidelines for when there is a questionable ballot for how they're supposed to determine voter intent. But no system is perfect, and in a very close election, there are ultimately going to be questions and arguments that arise over some of the ballots. What can we expect from a manual recount? When a manual recount begins, the ballots that are called undervotes and overvotes are pulled out. It might be that the voter just chose to skip the race, or in some cases, a voter didn't follow instructions and rather than marking the ballot in a way that a scanner could read it, they might have circled the candidate's name. In a manual recount, there will be some ballots that they might be able to see that and it will be unambiguous. But inevitably there are some ballots that people just marked in a strange way or have stray lines or people end up arguing over what the voter was intending to do. While the technology has changed from punch cards and dimpled chads, there's still that element of judgment calls that elections officials have to make about some ballots. The battle over Florida's three statewide recounts rages on in the courts. Why? You have to go back to the contested 2000 presidential election.